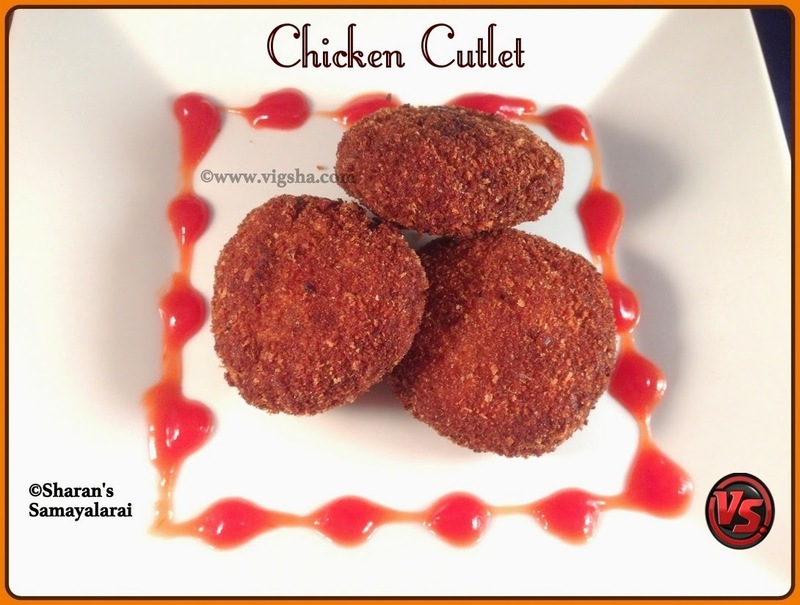 Chicken Cutlet is one of the tasty and delicious non-veg appetizer. These crispy cutlets are simple but elegant and have always been a guest pleaser. This is a fail-safe recipe and you will be loaded with compliments. These cutlets can be frozen which makes your job easier when you have a surprise guest for lunch or dinner. 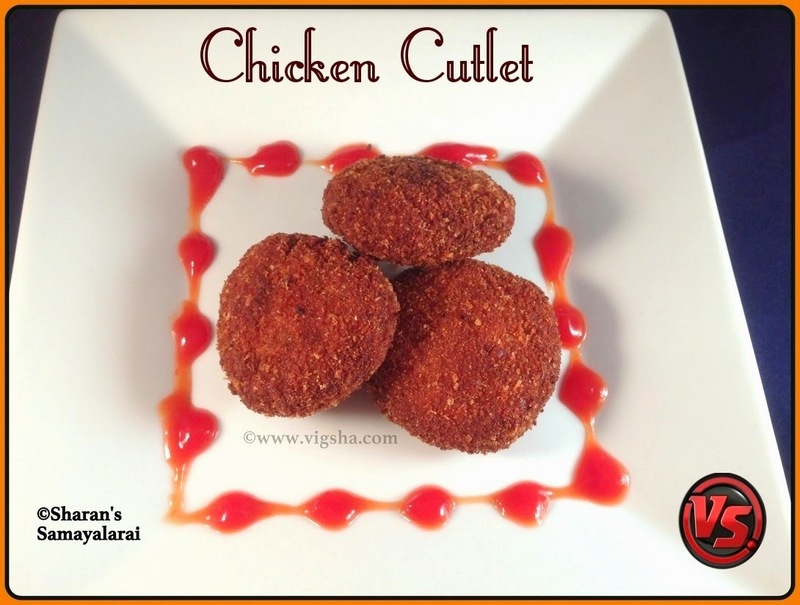 You can have these cutlets any time as an appetizer or a side dish or even as an evening snack. You can also use this as patty inside a burger bun and served it along with ketchup ! I got this recipe from my bestie, Sheeba. Her mom is a wonderful cook and I am a very big fan of her cooking. 1). Clean and cut the chicken into medium size pieces. I have used chicken breast for this recipe. Cube the potatoes and add it in a pressure cooker along with chicken, turmeric powder, ginger garlic paste, chilli powder and little salt. 2). Cook till the chicken becomes soft and tender (for 1 - 2 whistles). Once the pressure releases, drain and finely mince the chicken. Peel and mash the potatoes, keep it aside. In a mixing bowl, add the minced chicken, mashed potatoes, chopped onions, coriander leaves, mint leaves, green chillies, pepper powder and salt. 3). Combine everything together and make equal sized small balls. Flatten the balls slightly or roll into desired shapes. 4). In a separate bowl, beat the egg whites till fluffy. Dip the cutlet pieces in egg whites and roll in bread crumbs generously. Repeat the procedure and arrange it in a plate. 5). In a medium flame heat oil in a pan for deep frying or you can shallow fry the cutlets too. Gently slide the rolled cutlets in the oil. When the sides and bottom starts browning gently flip the cutlets. 6). Deep fry the cutlets till both sides turns golden brown. Drain them on a kitchen towel to strain the excess oil. Repeat the process ! Delicious cutlets are ready ! Serve hot with tomato ketchup. # Make sure not to add more water while pressure cooking the chicken. Else it will become watery. # Adjust the quantity of the chilli powder and pepper powder according to your spice levels. # You can keep the shaped cutlets for up-to 2 weeks. Bring it room temperature before frying or baking it when needed. # Adding coriander and mint leaves is optional. You can add any veggies along with this cutlet. Like, carrots, bell peppers, etc,.